Dr. Manpal Singh Narula, M.B.B.S, M.S. (Orthopaedics) is heading the Skin, Knee & Spine Clinic at Mukat Hospital, Chandigarh. 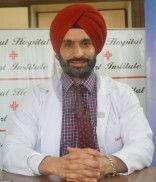 Prior to joining Mukat Hospital, he was associated with various eminent hospitals in and around Chandigarh, where he worked as Head of the department of Orthopaedics & Joint Director of reputed Hospitals. Dr. Narula completed his undergraduate degree from the premier institute, Christian Medical College, Ludhiana, followed by Post graduation in Orthopaedics from Governmnet Medical College, Patiala. Besides, he attained fellowships nationally & Internationally in Spine & Joint Replacements. To his credits, he has successfully performed more than 2000 joint replacements & spine surgeries. He is a member of various professional organizations and actively participates in various workshops and conferences to hone his practical knowledge to cope up with the international standards. When comes to neck and back pain Dr. Narula focuses on treating his patients by correcting their postures or advising for physical exercises rather than doing surgery.